There are many herbal supplements available that claim to help breastfeeding women to make more breast milk. One of the more popular supplements is called goat's rue. But, is goat's rue safe for breastfeeding moms and children? Does it actually work? Here you find some information about goats rue along with tips for using this herbal breastfeeding supplement. Goat's rue (Galega officinalis) is a plant native to Europe and the Middle East. It has been used in herbal medicine to treat tuberculosis and lower blood sugar levels. It's also a popular breastfeeding herb that women use to make more breast milk. Originally used in Europe, the dried leaves of the goat's rue plant were successful in boosting the milk production of cows and goats. Then, in the late 1800s, the plant was brought over to the United States as a food source for livestock. Unfortunately, it wasn't a good crop because of its bitter taste and toxic nature. In its fresh state, it turned out to be harmful, and even deadly to some of the animals. Today, while it's a pretty flowering plant, goat's rue is considered a poisonous weed in the United States. Popular in France and other European countries, the dried leaves of the goat's rue plant are considered to be a galactagogue, and this herb is often recommended to breastfeeding mothers to help increase the supply of breast milk. It is also used to stimulate the growth of breast tissue, so it may be helpful for women who wish to breastfeed after breast surgery and those who plan to breastfeed an adopted child. Goat's Rue belongs to the same plant family as fenugreek. Some women say it works just as well or even better than fenugreek. But, it doesn't seem to work for everyone. Goat's rue may help some breastfeeding women build up their breast tissue and make more breast milk. Some studies show that goat's rue may help lower blood sugar levels in diabetic patients. Cancer research studies are now being carried out to see if goat's rue is useful in the fight against cancer. It has been used as a diuretic (water pill) to help the body remove water through urine. Goat's rue has been shown to have anti-bacterial properties. You should not use the fresh goat's rue plant. It is considered toxic and dangerous. However, it is generally considered safe to take this herb in capsule form or to use the dried plant leaves in tea. As a Tea: Place one teaspoon of dried goat's rue leaves in 8 ounces (1 cup) of water and let it sit for 10 minutes. You can drink one cup of tea up to three times a day. You can also add other breastfeeding herbs to your tea such as alfalfa, blessed thistle, fennel, and stinging nettle. Capsules: A typical dose of goat's rue capsules is one capsule 3 or 4 times a day. You should only buy your product from a reputable company and follow the dosing directions given to you by your doctor or lactation consultant. Goat's rue is also an ingredient in some commercially available teas and herbal supplements made specifically for breastfeeding mothers. Goat's rue is a plant that's believed to be lethal for some animals. In the fresh form, goat's rue is poisonous and should not be used. It only goes to show that herbal treatments can be dangerous. So, you should always consult with your physician, lactation consultant, or herbal specialist before taking any herbs or supplements, especially if you're pregnant or breastfeeding. Do not use goat's rue if you have diabetes or hypoglycemia unless you are under the direct care of your doctor. Goat's rue can lower your blood sugar to dangerous levels or interfere with your medication. Allergic reactions can occur. 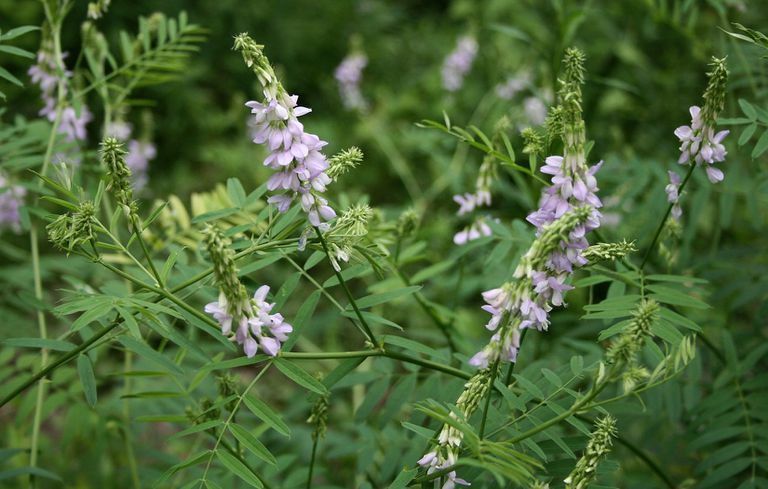 Goat's rue is a member of the pea family of plants which also includes peanuts, soybean, alfalfa, and fenugreek. If you have an allergy or sensitivity to any of these foods or plants, do not use goat's rue. Avoid this herb if you tend to have an overabundant breast milk supply. Goat's rue could further increase your milk supply and lead to breastfeeding problems such as breast engorgement, plugged milk ducts, and mastitis. If you'd like to boost your breast milk supply, goat's rue may be worth a try. Goat's rue can be a very effective herb for increasing the supply of breast milk. And, when used in moderation, the dried leaves are considered safe for breastfeeding moms and babies. But, if you do decide to use goat's rue, it's always best to discuss it with your doctor and purchase this herb from a reliable source. Abascal K, Yarnell E. Botanical galactagogues. Alternative and Complementary Therapies. 2008 Dec 1;14(6):288-94. Dog TL. The use of botanicals during pregnancy and lactation. Alternative Therapies in Health and Medicine. 2009 Jan 1;15(1):54. Stritch, Larry. Goats Rue. US Forest Service Celebrating Wildflowers.